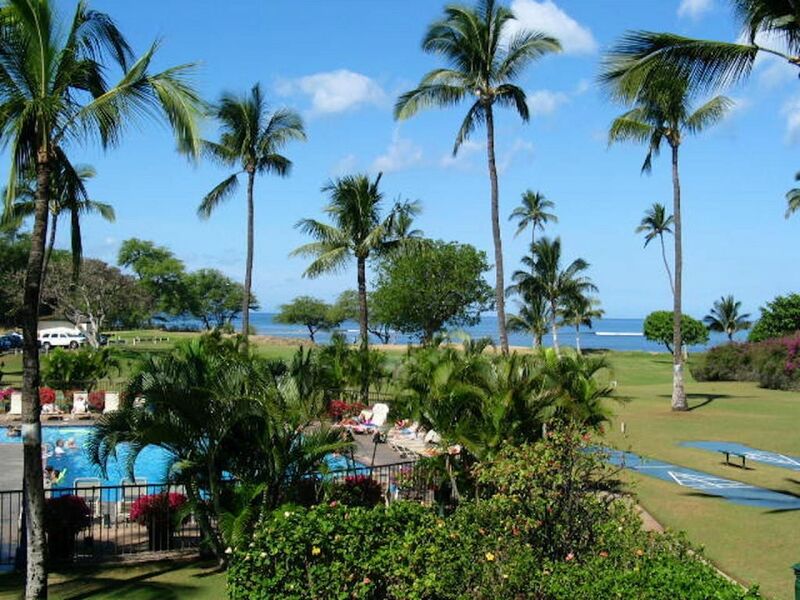 Maui Sunset is a beautiful oceanfront resort and is the perfect vacation home on Maui. Swim in the large swimming pool or just enjoy sitting on a chaise lounge by the pool or in the jet spa. It is especially beautiful in the evening relaxing under the stars and enjoying the tiki lights around the pool. The resort also has two tennis courts, a shuffleboard court, putting green, an exercise room, gas BBQ grills, etc. Watch the sun rise over Haleakala Crater and set over the ocean. Our condo (Unit A216) is located on the 2nd floor and has a great view overlooking the pool to the ocean. There are two bathrooms, one with a walk-in shower and one with a tub/shower combination. Our unit is fully air conditioned and also has ceiling fans. The bedroom has a queen bed and there is a queen sized sofa hidabed and a twin sized daybed in the living room. Enjoy the convenience of a complete kitchen. The kitchen includes electric stove, microwave, refrigerator, dishwasher, toaster and coffeepot. We also provide dishes, pots and pans as well as an iron and ironing board. All towels (including beach towels) and linens are provided. Relax watching the cable TV or sit on our large 112 sq. ft. private lanai enjoying the view of the pool and ocean as well as the gorgeous sunsets. In the winter be sure and watch for the whales. There is an Activity Center by the pool which can assist you in planning your activities or with reservations. Maui Sunset is on the southwest side of Maui in Kihei and is approximately 12 miles from the Kahului Airport. It is close to miles of sandy beaches as well as restaurants, grocery stores and golf courses. Incredibly well maintained grounds! Beautiful area. We’ve been returning for years. So glad you enjoyed your stay! We would love to have you back! 5-star Piece of Paradise, GREAT host, condo, property!! Terry is an exceptional host. He answers questions quickly and professionally during booking, check-in and through out stay. A216 is an awesome unit - great ocean view, relaxing balcony, and clean interiors. The kitchen has granite counter tops and the cabinets appear new. Kitchen was fully equipped, even had paper plates, napkins, plastic utensils for our convenience. TV had adequate stations as we enjoyed the royal wedding. AC in the bedroom and living room were effective as needed. What's really impressive is how well maintained Maui Sunset is... pool guys were cleaning every morning, golf course quality lawn were mowed and watered often, jacuzzi is kept at 102F! I was concerned about being close to the pool and noise, but it wasn't a factor at all. I could keep the screen door open for fresh air without concern about noise from the outside. We had researched just about every property in Kihei and loved this because of amenities, no need to cross street to get to ocean... oh, there's even 2 tennis courts on which to play, and the guest counter had tennis recess and balls to loan out for free:) would come back again and bring my whole family! Thanks Terry... what a blessing! So glad you enjoyed your stay! We would love to have you come back again.